Before Sunday’s slate of games got going, there was some serious drama in London as the Jacksonville Jaguars made headlines for all the wrong reasons. That should have clued us in to the fact that NFL Week 8 was going to get weird. The league’s most dominant defense was smashed to bits. Adrian Peterson outplayed Saquon Barkley. And a former No. 1 overall pick hit a new low. These were the biggest winners and losers from NFL Week 8. There’s a lot of warranted gushing about what Patrick Mahomes is doing in his second season. But let’s not forget about Houston’s second-year passer, who is back with a vengeance after an ACL took him out as a rookie. Watson and the Texans improved to 5-3 with a blowout win over Miami on Thursday night. He was nearly perfect, completing 16-of-20 passes for 239 yards with five touchdowns and no interceptions. This brings his seasonal total up to 2,176 yards and 15 touchdowns through the air, and he’s heating up as his offensive line and running game rounds into shape. 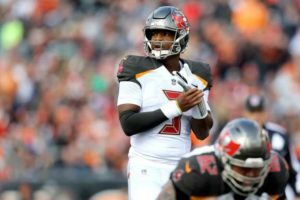 Despite missing the first three games of the 2018 season to suspension, Winston exits Week 8 with 10 interceptions, good for second-worst total in the league. He threw four of them on Sunday against Cincinnati, including a truly nauseating pick-six, before being benched for Ryan Fitzpatrick. Even more damning as it concerns Winston’s potential job security (or lack thereof) is the fact that once Fitzpatrick entered the game, suddenly the Bucs were alive on offense. After the pick-six, Cincinnati was up 34-16. Fitzpatrick tied the game up with three scoring drives in the final 17 minutes of the game before the Bengals won it on a field goal as time expired. Winston cannot keep his job after this, and he’s teetering dangerously toward the bust label. Heading into Week 8, Baltimore’s defense was playing better than any other the league had to offer. 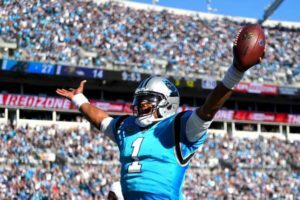 It ranked third in yards allowed and first in points allowed, leading many to speculate that Sunday wasn’t going to be a banner day for Cam Newton. That couldn’t have been further from the truth. Playing like a legitimate MVP candidate, Super Cam showed up in a big way. Executing Norv Turner’s offense to perfection, he utterly shredded the Ravens, both on the ground and through the air. Newton completed 20-of-29 passes for 219 yards and no interceptions — though, it’s true teammate Christian McCaffrey bailed him out in a big way in the end zone. He rushed for 52 yards and a touchdown on 10 carries. More importantly, the Panthers crushed the Ravens at home, 36-21, to improve to 5-2 on the season. To nobody’s surprise, the New York Giants are still completely broken on offense. Despite big games from Odell Beckham Jr. and Saquon Barkley, who combined for 247 yards, Big Blue managed just 13 total points — well below their already pathetic average of 19.6 per game. 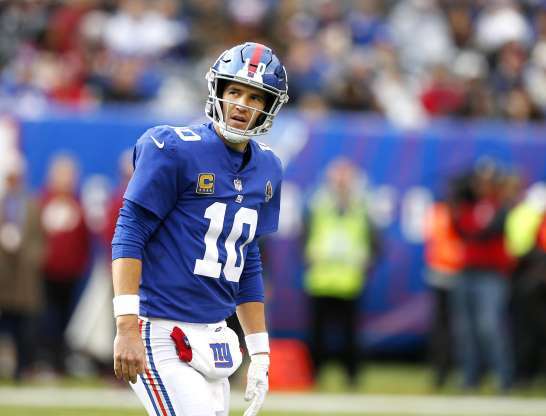 Eli Manning was wrecked in the pocket as New York’s abysmal offensive line resembled a wet paper bag against Washington’s vaunted defensive front. He was sacked seven times and hit 10 times. He also threw two bad interceptions. New York’s defense also is partly to blame for the outcome Sunday, as it collapsed down the stretch when it needed to step up the most. The Giants head into the second half of the season with a single win, and that feels like it happened ages ago. One of the most memorable rookie seasons in memory has been cruelly cut short. Houston Texans quarterback Deshaun Watson tore his right ACL in practice Thursday, sources informed of the situation told NFL Network Insider Ian Rapoport and NFL Network’s Mike Garafolo. Watson’s remarkable debut season is over. An MRI on the knee confirmed the full extent of the injury, Rapoport reported. He suffered it on a non-contact play, Rapoport added. Watson, who tore his left ACL during his playing days at Clemson, is facing an 8-9 month rehabilitation and should be back in time for the start of the 2018 season. Texans coach Bill O’Brien did not talk about any issues regarding Watson’s knee during his Thursday news conference. The team only listed Watson as limited after the practice session. “I talked to Deshaun late this afternoon and we are disappointed,” said Dabo Swinney, who coached Watson during his days at Clemson. “But he is a person who has had some setbacks in his life and always comes back stronger. Since he went through the rehab [for a torn ACL] before, he knows what it takes. Watson was coming off the most impressive performance of his young career before suffering the injury. He passed for 402 yards and four touchdowns in the Texans’ 41-38 loss to the Seattle Seahawks in one of the most exciting games of the season. The performance helped make him the first rookie quarterback to ever win AFC Offensive Player of the Month honors on Thursday. He also was named the NFL’s Offensive Rookie of the Month for October. Watson passed for 1,699 yards over six games and is tied for the NFL lead in passing touchdowns with 19. It was the most passing touchdowns over the first seven career games since 1970, passing Hall of Fame quarterback Kurt Warner’s mark. The Texans scored more than 33 points in each of his four October starts. Seattle Narrowly Beats Texans While DeShaun Watson Has Coming Out Party. 1a. We all know about Pete Carroll’s now 8-1 record against rookie passers at home, but Deshaun Watson is a different creation entirely. The first-year Texans quarterback showed no fear on Sunday, drawing first blood with a beautifully thrown 59-yard strike to Will Fuller, the first opening-quarter touchdown given up by Seattle all season. Watson’s fast start took a hit when All-Pro safety Earl Thomas instinctively jumped a route one drive later for a 70-yard pick six, but Watson shook off the turnover to pile up 402 yards passing with four touchdowns on the day. The rookie also lobbed a pair of second-half picks to Richard Sherman, but I love how Watson shrugs off these occasional setbacks. 1b. Seahawks ticket-holders have enjoyed outstanding defense at home for ages, making Sunday’s performance by the Texans all the more fascinating. Midway through the second quarter, Houston had outgained Seattle 246 yards to 77 with 14 first downs to merely four for the ‘Hawks. The explosive nature of this attack is legitimate, with Watson fearlessly testing the Legion of Boom with deep shots and patiently using his feet to move the chains. The Texans rookie showed full command, especially during a juicy fourth-quarter touchdown drive that saw him spin away from pressure to find Lamar Millerin the end zone to put the Texans up 31-27. Watson is a rainmaker. 2. The brilliant Russell Wilson offered tricks of his own during a game capped by a signature come-from-behind drive by the Seahawks star quarterback. After throwing a killer pick with 5:37 remaining and Houston up 38-34, Wilson authored a marvelous three-play, 80-yard touchdown drive capped by his 18-yard scoring strike to tight end Jimmy Graham to put the game away. It was another reminder of Wilson’s unique, magical abilities. The veteran unfurled a catalog of sensational throws against Houston’s wanting secondary, tossing a pair of scoring bullets to Paul Richardson and a 53-yard bomb to receiver Tanner McEvoy during a game that saw both teams combine for 79 points, 988 yards and five lead changes. Wilson’s efforts are even more impressive as he’s doing this for an offense utterly bereft of a ground game. In the end, it will be Deshaun. While Texans coach Bill O’Brien refused to name his starting quarterback for Thursday night’s bout with the Bengals, the decision has already been made. 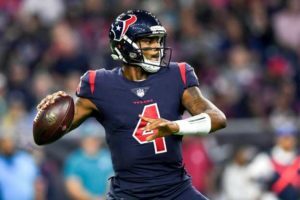 NFL Network Insider Ian Rapoport and NFL Network’s James Palmer reported Tuesday that rookie Deshaun Watson has earned the nod over veteran Tom Savage, per sources. The game will be aired exclusively on NFL Network. The first-rounder becomes the ninth quarterback to start under O’Brien since 2014, the most by any NFL team during that span. The decision comes as little surprise after Palmer reported that Watson took every snap with the first-string offensive line during the walkthrough portion of Tuesday’s practice. Savage was yanked at halftime of Sunday’s loss to the Jaguars after absorbing six sacks and losing a pair of fumbles. Watson suffered four takedowns of his own — and threw a pick — but the former Clemson star guided the Texans to their only touchdown of the day. The rookie also came out of the loss with an ankle injury, but Watson was upgraded to a “full” participant in Tuesday’s practice. With Houston’s offensive line looking ultra-shaky in the opener, Watson’s quick feet and ability to extend plays give the Texans more of a shot, in theory, to keep the offense moving. It’s on O’Brien now to give his young passer adequate time to grow before making another quick switch under center. President Donald Trump welcomed Clemson to the White House on Monday to celebrate the Tigers’ victory over Alabama in January’s national title game. During the ceremony, Trump even offered up a scouting report on former Tigers quarterback Deshaun Watson, who was drafted 12th overall by the Houston Texans in the 2017 NFL Draft. The Texans certainly hope so. The Brock Osweiler Experience couldn’t have gone worse and the team jumpstarted their search for a franchise quarterback after just one season.
.@TimTebow has tremendous talent and a proven ability to lead. He deserves to be in the @nfl. Tebow remains out of the NFL. The quarterbacks in the 2017 NFL draft class have heard the naysayers. If teams are looking for a sure thing at the top of the draft — say a Terry Bradshaw, John Elway, Peyton Manning or Andrew Luck — it’s probably not happening this year. But don’t tell that to the draftees. In most draft years, the pecking order at the top for quarterbacks is set by the time they report to Indianapolis in February for the scouting combine. This year’s class is different, as the opinions vary widely on the best available passers. As a result, those players might actually change their stock significantly between now and the draft’s opening night on April 27. It also means every interview, clip of video, private workout and even offhanded comment could move one of the quarterbacks to the head of the class. Watson, North Carolina’s Mitch Trubisky, Texas Tech’s Patrick Mahomes II, Notre Dame’s DeShone Kizer, Pitt’s Nathan Peterman and Cal’s Davis Webb are on many teams’ draft boards. But how they’re ranked differs widely around the league, as the beauty of this class of passers is truly in the eyes of the beholder. The group has more riding on these last-look workouts and visits than many of its predecessors. In previous years, quarterback prospects were trying to move up a few picks in the weeks leading up to the draft. This group could move entire rounds as they leapfrog each other based on tryouts. Why We Should Stop Labeling Quarterbacks. Well, good news, Deshaun: You might have personally played a critical role in making that “dual-threat” label obsolete. Watson and quarterbacks with similar skill sets have changed college football and quarterback recruiting, and they should change the accepted definition of what a “dual-threat” quarterback is. Almost exclusively, dual-threat quarterbacks have been those whose scrambling ability far outweighed their talent throwing the ball, while those without that running ability were deemed “pocket passers” and “pro-style” quarterbacks. What happens now, when agility, mobility and movement in and out of the pocket aren’t just bonuses — they’re necessities — when it comes to quarterbacks? Maybe it’s time to slide that “pro-style” designation away from “pocket passer” and over to “dual-threat,” where it truly belongs. Watson threw for 420 yards and three touchdowns in leading Clemson to a win over Alabama in the national championship game. He rushed for 43 yards and another score. And the Tigers aren’t the only program heading that direction, as three young signal-callers took over at historic bluebloods and led the way to successful seasons. With Sam Darnold at USC, Trace McSorley at Penn State and Jalen Hurts at Alabama, three programs where pocket passers have dominated the landscape went to dual-threats this year. None of it involved moving away from pro-style offenses. Clemson coach Dabo Swinney says there’s no doubt that his star quarterback should be the first overall pick in the draft. In fact, Swinney says that if the Browns don’t use the No. 1 pick on Deshaun Watson, they’re making a historic mistake that will haunt the franchise for years. Two teams did pass on Michael Jordan in the 1984 NBA draft: The Houston Rockets took Akeem Olajuwon first overall, and he became a Hall of Famer who led the Rockets to NBA titles in the two years when Jordan left the Chicago Bulls. But the Portland Trail Blazers selected Sam Bowie second overall before the Bulls took Jordan third, and the Bowie selection is often remembered as one of the worst picks in draft history. If the Browns choose Texas A&M pass rusher Myles Garrett, the odds-on favorite to be the first overall pick, they’ll be hoping he’s more an Olajuwon than a Bowie. But Swinney says they should just take Watson, and get football’s Michael Jordan.